The purchase of a driving horse can be tricky as it will be ridden as well as used to draw a carriage, work at the three paces and must therefore be docile. Whether for your personal pleasure, to go on walks ... or to be invited to weddings (carriages have a romantic effect! ), do agricultural work or longshoring, the horse must adapt and have a quiet nature and a flexible character. 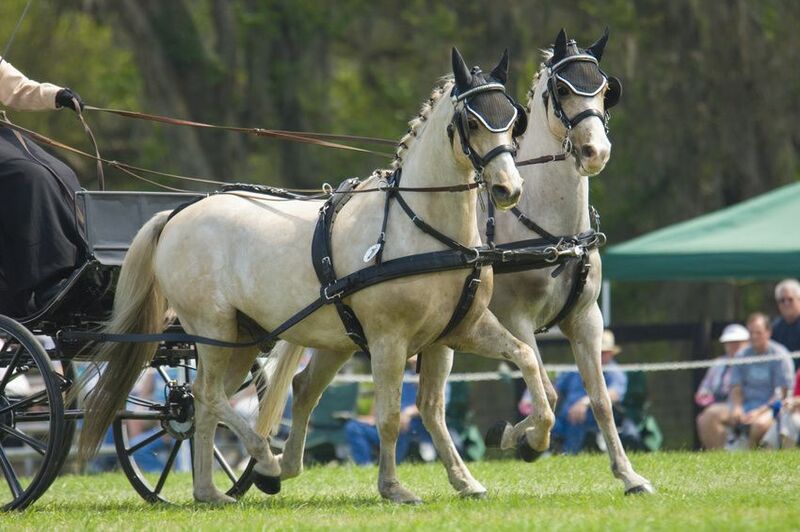 If the imposing draft horses, such as the percheron cobs and warmblood are often used for the carriage, there is however no breed to be favored. Whatever horse is chosen (trotters can be excellent carthorses), he must obey to your voice, be strong, work with his shoulders and not have to suffer from a poorly positioned hitch or harness or one that’s not adapted to the horse. This requires the owner to have a concrete knowledge of this discipline and the method of putting on the harness. This last point is not trivial. It's about being confident and one with your horse (or your horses, if it is a paired hitch) while ensuring your well-being. A good pace, staying calm, a balanced horse allows the leader to remain in control of the situation. If the horse is well trained from the start, there will be no problems.. The physical efforts demanded from the driving horse are different from those required of the mounted horse. He must be strong, has endurance, be patient. For heavy work or heavy loads, a large and heavy animal is needed. He will have to work longer, even slowly, and sometimes travel long distances, with patience and endurance. It is an athlete who does not necessarily look like one and works on the long term, because the team does not have the same impact as riding on the skeleton of the horse and its joints. Of course, the choice of a driving horse depends primarily on the tasks for which it is intended. There are three main types of hitches: the heavy draft hitch, the light hitch and the competition hitch. Choose your horse according to the type of hitch you want to use and the carriage you use. Even if you do not appreciate the elegance of the driving horse, pay attention to his commitment, the rhythm and regularity of his movements, the straightness of his feet. It should be known that efficient paces, even though they are sometimes less attractive, save, in the short and long term, the conformation of the horse. For a team with several horses, choose them from the same breed. Inequality among the team can create difficulties. On roads and close to traffic, your horse must stay calm. Before hitching a horse, you must be ensured that its temperament is adapted to this discipline: it must cooperate, be obedient, even in tricky situations. (Do not forget the learning process for this discipline). You must be logged in to be able to comment on this article.